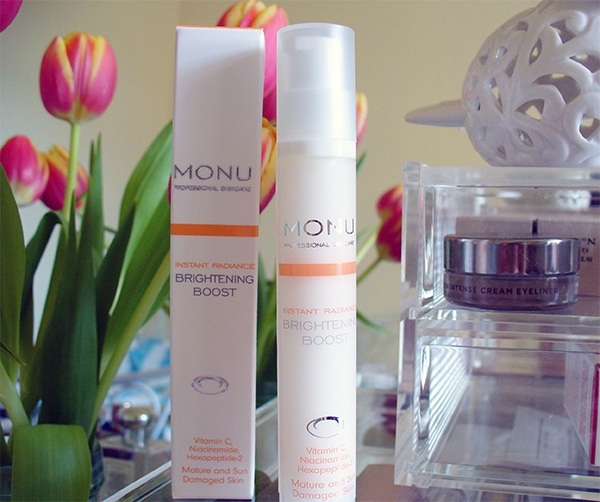 This MONU Brightening Boost Serum* has been a staple in my summer skincare routine, I have been road testing it for about 3 months now and my skin loves it. It is a lightweight serum designed for more Mature Skin or those that have Sun Damage but I think it can be used by people of all ages and It’s an ideal product for people with a dull complexion as it leaves your skin instantly smooth and looking radiant. I find it to be very hydrating and lightweight, I massage two pumps worth into my face and neck and that is quickly absorbed leaving my skin looking smooth, bright and feeling soft. I have been using it on the backs of my hands too as I do have a couple of age spots appearing & it seems to be helping them look lighter. I will keep applying it until I’ve run out & let you know if there are significant changes to them. That’s a lot of promises but I will say that you see almost instantly a brightening and smoothing of the skin which helps your complexion look radiant and healthy. I don’t have hyperpigmentation so can’t comment on that but my skin tone is looking even and a few dark spots around my eyes are looking less visible. I’m not too sure I have a huge amount of visible sun damage but I guess it can do no harm in keeping the effects of sun damage at bay. This serum contains Vitamin C which helps combat free radicals and helps even skin tone. Also, Hyaluronic Microspheres which hydrate and plump the skin helping to reduce the visibility of wrinkles. Which is something I really need help with, I have quite a few wrinkles around my eyes & a few appearing on my forehead, so anything I can do to keep them as small and not notable. The packaging is also sleek and in a frosted bottle, it looks and feels expensive. It takes up no room as all in my skincare box & is a great size if you travel often, the bottle is so slim and has a very handy pump. I like the hydrating feel to this serum and how easily it absorbs into the skin. Its gives me radiant healthy looking complexion but its always hard to say definitively if a product is helping you look younger & diminish signs of sun damage. I’m naturally freckly and have quite fair skin so this serum can be doing no harm in helping fight the signs of ageing & sun damage. As I’ve said in many posts I’m very much in to SPF and wearing it all year round but there are times when we are exposed to the sun & this serum seems like an effective way of giving your skin a boost to keep some of the first signs of ageing at bay and help you improve skin tone. Its been a welcomed addition to my skincare routine & if asked I would recommend it to people that are concerned with dull skin & that want to give their skin a boost of Vitamin C to give them radiance and even out their skin tone. I also think this wears well under my makeup and helps my skin look radiant all day long. I think my mum would really like this serum. Let me know what skincare products you are using to help give your skin radiance & let me know if you have tried anything from MONU and have any other recommendations of product that I should try from them.